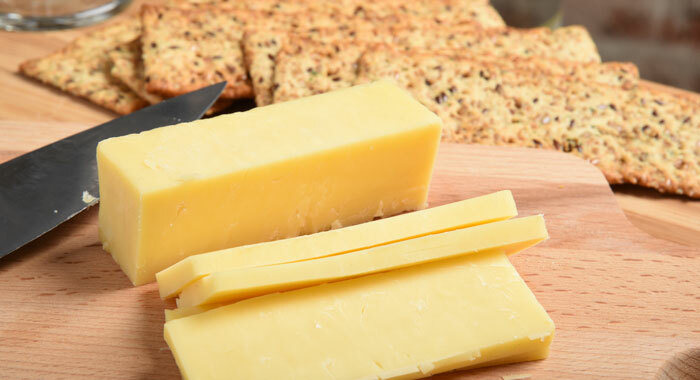 Sometimes described as the most eaten cheese in the world, cheddar first appeared in the UK county of Somerset in the 12th Century. Its name comes from the caves in the town of Cheddar which were used to store the cheese. The term cheddaring is derived from the cheese-making process whereby the curds are turned and stacked to drain off the whey. The curds are then kept warm for between 90 minutes and two hours. Cheddar should have a crumbly texture. Young cheddar will have a creamy, mild taste while more mature cheeses will have stronger, more complex flavours.